Japan now hosts the world's largest indoor farm, producing up to 10,000 head of lettuce each day. After an earthquake and tsunami decimated northeast Japan in 2011 – an unexpected weather incident that scientists are still struggling to understand – the Japanese government built Sanriku Fukko National Park. A triumph of weather-conscious design, built in part to revitalize the area’s flagging economy, the park boasts reconstructed pine forests, tidal flats and seagrass beds hugging the coast. And deep within the park’s faux-natural artifice sits exactly one farm. Not just any farm, however. Sanriku Fukko now hosts the world’s largest indoor farm, producing up to 10,000 heads of lettuce each day under the artificial glow of LED lights. 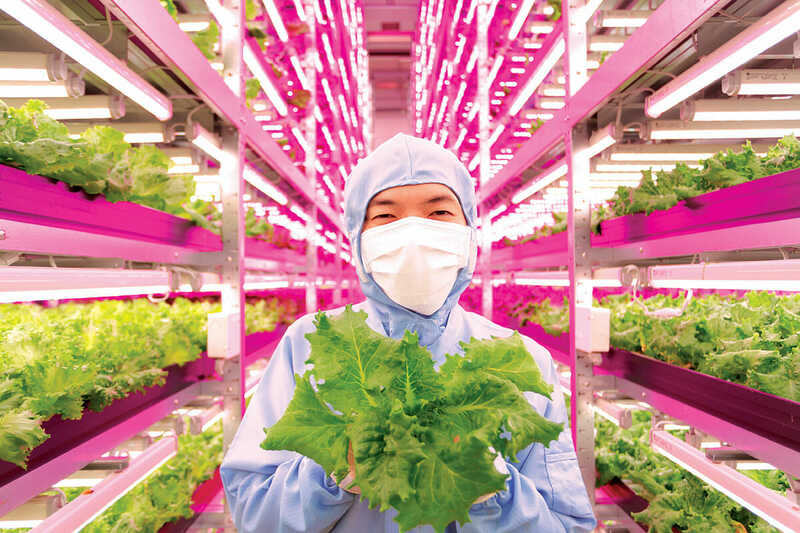 Housed inside a former semiconductor factory, the 25,000-square-foot farm – a partnership of GE Japan and indoor farming company Mirai – is one in a series of weather-resistant, futuristic “plant factories” across Japan. The cultivation room is a spare, modernist operation: slick orange floors and concrete walls rising above a grid ‘of thin metal racks. Each day, approximately 30 people mill about the plant, some dressed head-to-toe in white jumpsuits and surgical masks, tending to thousands of precisely arranged, bright green leaves. Bathed in the bubble-gum glow of 17,500 blue and red LEDs, these modern farmers spend eight hours per day doing everything from seeding empty racks to packaging heads of harvested lettuce. Is this the global future of farming? More than 150 natural disasters have struck Japan in the past 30 years, thanks in part to four tectonic plates underneath the islands’ crust. Then there are the storms: Two massive typhoons hit Japan just this fall. Climate change has caused a marked increase in the “frequency and intensity of extreme weather events” in Japan, according to a study by the World Wildlife Fund. The tech-savvy nation has consequently become a world leader in disaster preparedness and climate change adaptation. 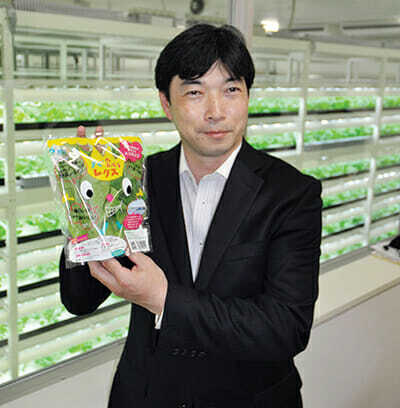 Sanriku Fukko’s indoor farm, brainchild of plant physiologist Shigeharu Shimamura, resulted from the Mirai-GE partnership immediately following the 2011 earthquake. 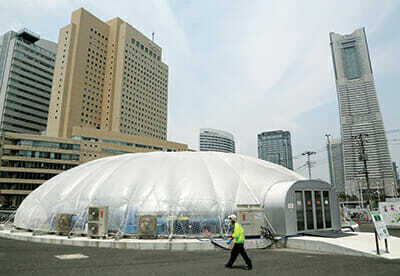 An employee walks past Granpa Farm's dome-shaped vegetable plant in Yokohama. / Courtesy Haruyoshi Yamaguchi. President Shigeharu Shimamura of Mirai Co. holds a bag of lettuce produced at a large-scale plant factory in Kashiwa. / Courtesy GE Lighting. After the quake’s resultant Fukushima nuclear disaster, rice and vegetable production dropped sharply. To kickstart domestic farming – and assuage consumer fears about tainted produce – Japan’s government began subsidizing indoor farms. Japanese farmers quickly fell in love with the rapid growth rate, ability to control photosynthesis and high-quality vegetables – Mirai and GE Japan claim that their lettuce has eight-to-ten times more beta-carotene and twice the vitamin C, calcium and magnesium of its outdoor-grown counterparts. According to Japan’s Ministry of Agriculture, Forestry and Fisheries, the number of plant factories has gone from 64 to 211 since 2011 – and Tokyo’s Yano Research Institute predicts that the country’s indoor farm market will jump from about $30 million to $279 million by 2020. Sanriku Fukko now hosts the world’s largest indoor farm, producing up to 10,000 head of lettuce each day. Columbia University professor Dickson Despommier pioneered the concept of vertical farms – crops grown in urban structures like skyscrapers and abandoned buildings – in 1999, when LED lights were about 20 percent more efficient than incandescent light bulbs; his critics argued that their high energy costs made them unrealistic. About five years ago, Despommier says, companies created LEDs that were 28 percent more efficient than incandescents. Then, last year, Philips announced that it had developed an LED lamp that was 68 percent more efficient, according to Despommier’s calculations. (Philips’ own estimate is even higher – they say the new LEDs can use 80 percent less energy than incandescents in greenhouses, 30 to 70 percent less energy than fluorescents.) 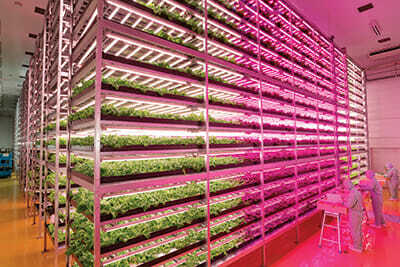 Despommier maintains that these advances in LED technology will change the entire indoor farming industry. “Five years ago, you could not do this because of the price of energy,” he says, noting the exception of transparent structures like Sky Greens in Singapore. But the key strength of the indoor farm is its ability to bounce back from unpredictable conditions. Indoor farms like Mirai’s require very little to function – similar projects have been constructed in an abandoned warehouse, a refurbished factory and one floor of an apartment building – so even if they don’t withstand a disaster, the economic losses and costs to rebuild are minimal. “In case there is another earthquake, tsunami or other terrible weather event, it is easy to rebuild the LED farm,” says Tomoaki Kimura, general manager of GE Lighting Japan. 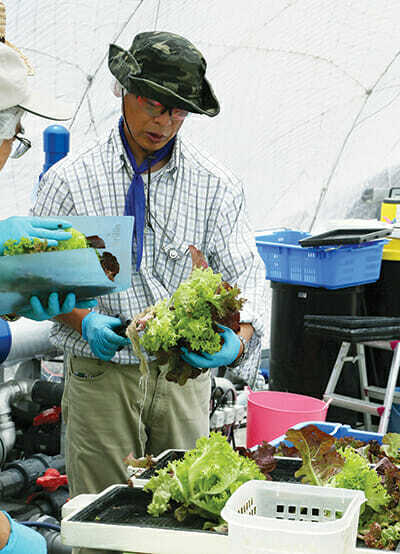 An employee works beside a culture pool for lettuce at Granpa Farm in Yokohama. / Courtesy Haruyoshi Yamaguchi. Workers at the GE lettuce factory. / Courtesy Kyodo (AP Images). If you think this all sounds too good to be true, you aren’t alone. Louis D. Albright, professor emeritus of biological and environmental engineering at Cornell University, is an outspoken critic of indoor farming. Despite advances in efficiency, he still believes it is not the best option because of the large carbon footprint that most electric generators produce. “Even if the LEDs were 100 percent efficient, the need for 100 percent electrical lighting creates a greater carbon footprint than the footprint created by shipping the produce from coast to coast,” he says. Albright believes LEDs will eventually be ubiquitous in the plant-growing industry, but only as a supplement to natural sunlight in greenhouses. In the meantime, companies will continue to test the waters. At a recent urban agriculture conference, Philips announced an experimental vertical farm to be built on its research campus in Eindhoven in the Netherlands, which will begin growing leafy greens and herbs by the end of the year. And Despommier has mentored aspiring indoor farmers all over the U.S., from Bedford Park, Illinois, to Green Spirit Farms in Michigan, some of whom are working with the kind of hybrid system Albright would approve of. As for Mirai, there are 25 plant factories throughout Japan and two more large farms under construction this year. In Mongolia, two factories have begun producing 3,360 lettuce heads per day, while a 4,460-lettuce factory will be completed in Hong Kong by this winter. Contracts will soon conclude in Russia, according to Mirai’s Shohei Yoshimoto, where a 10,000-lettuce factory to rival Tohoku’s is being planned. Those enamored with lush, pastoral landscapes and wide open spaces might not easily warm to produce from such sterile, lab-like operations. But with the global average temperature expected to increase more than twice as much as it has in the previous century, plant factories might someday be the only way to enjoy fresh – albeit LED-grown – lettuce. Top: A worker at the GE lettuce factory. / Courtesy GE Lighting.